I’m an au natural gal, as in I hate to cover my hands up while working with anything, especially in the yard. I love to keep my nails done, but I will happily sacrifice them to the dirt gods when digging, pulling weeds, cutting flowers, planting bulbs, etc… in the yard and garden. It seems so hard to grasp tools and get a good hold on so many other things with bulky gardening gloves (I mean seriously, have you ever tried to open a pocket knife with gloves on???). And most of the time, if you are covering your hands up for a prickly plant- the darn gloves aren’t thick enough anyway for good protection. But there does come a time when you just can’t avoid that extra layer, and when you do decide to buy into hand protection, make sure to look into your options in order to get what you need for your local vegetative needs. 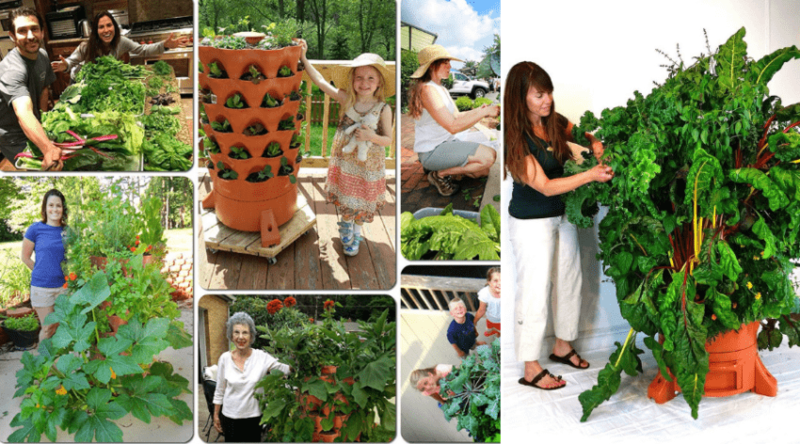 Read on below for some of my favorite picks to make work in your garden easier, rather than an added nuisance. Not all gloves are made alike, and depending on what sort of work you are wanting to attack outside, you’ll want to consider what your gloves are made of before you reach for either tool or plant. Glove materials vary in both thickness, versatility, flex, and design, and having the wrong pair might end up in a painful process. There are a variety of different leathers on the market for you to choose from, and can range from supple and form fitting, to thick and bulky. The highest quality leathers include goatskin, which is a softer, more durable leather that is puncture resistant and forms well to your hand. Goatskin leathers also have a higher price tag, and because of this many other leathers are substituted for glove material. The most popular leather used is pigskin, due to its flexibility with consistent use, and relative durability. Because it is a less expensive choice, it is used more often. Leather gloves really are the best gardening gloves for thorns, and if you have roses or other brambles you’ll want to keep that in mind. Split cowhide is another popular and inexpensive choice. Durable and rugged, cow leather is rough and can handle some of the toughest jobs. It also wears extremely well, and can last for years. However it can be very stiff and unyielding, and can be problematic for people with smaller hands. Synthetic leather is just that, a man-made product that mimics real leathers and are used for further durabilities. Popular because of their more inexpensive cost, synthetics will often be used to line the palms of gloves made of other materials to reinforce heavily used areas, but overall will still not last as long as the real thing overtime. Synthetics also can crack and peel with use and weather, however they also can be more readily cleaned and tolerate water better without becoming stiff like real leathers will. 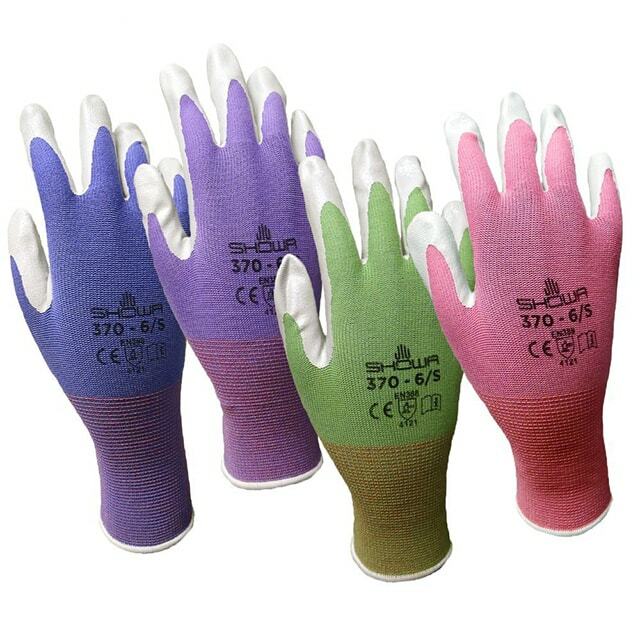 Probably the most popular material choice, cotton gloves are lightweight, breathable, washable, and come in a variety of different colors and patterns. 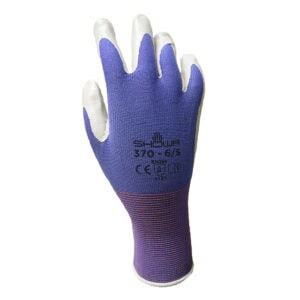 The downside to a cotton glove is the fact they are for lightweight use only, are not exactly form fitting, and mostly are used to simple hand protection or coverage from pruning and digging. Anything sharp will easily puncture a cotton glove, and if you are working in an area where there are seedheads that use barbs for transfer, you will get them stuck on these gloves. Nitrile is a rubber-like, waterproof coating used for both reinforcement on other materials (such as cotton), and as a full, waterproofed gardening glove version. This provides protection from the elements, moisture, and an added barrier between your hands and prickly stems and thorns. Because it isn’t breathable, your hands most likely will sweat which can cause discomfort for some people. But if you are looking for the best waterproof gardening glove, nitrile coating is a keyword of choice to use in your search. 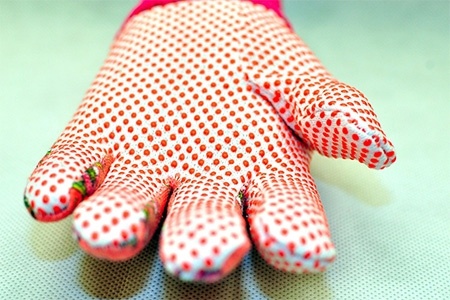 There are a variety of other materials used within gardening gloves, including lycra and spandex for stretch, or neoprene for durability and waterproofing. Most often these are used in a blend with cottons, or pieced in for added protection with other materials. When choosing gloves, fit should generally be an important consideration. To start, some gloves are made exclusively for women, or smaller hands, and others for men. There is often a distinct difference between gloves that are gender labeled due to length of fingers and and width of the palm. Be sure to take this into account when looking for fit if this is an important consideration when working with tools in the garden. As mentioned above, some materials provide more flex and stretch than others. And when working with tools, or at times that grasping and holding is important, you’ll appreciate the added movement allowed. If your hands are stiff, or if you suffer from arthritis, ease of flexibility is going to be important in your search. Thicker, more protective gloves can be difficult to bend at the joints, and if they are near impossible to flex to at first, most likely will not loosen up with use. What you but is most likely what you get. Try making a fist, spreading your fingers out, and grasping objects to determine your comfort level before purchase to see if you can complete your normal yard and garden tasks. 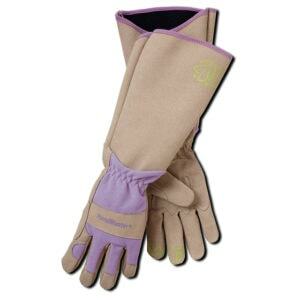 When digging or weeding it is easy for loose materials to fall into glove top openings. If you are doing a lot of ground work, consider a glove with a wrist closure of some sort. Elastic closures, or adjustable velcro straps are good choices and will help keep more of a snug fit and the worst of debris out of the rest of the glove. 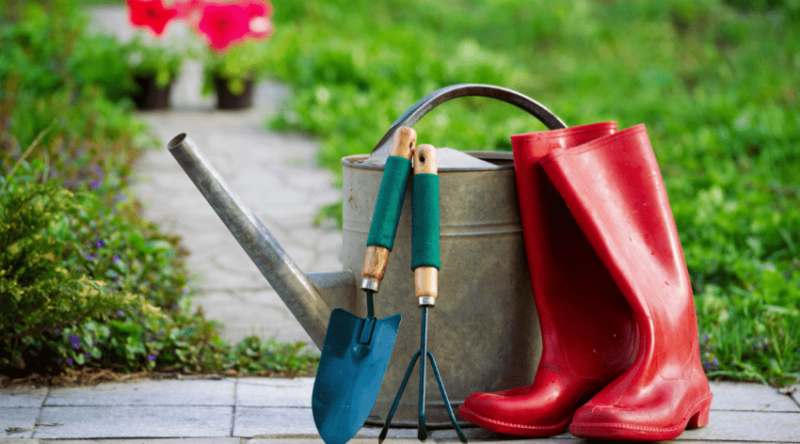 If you are doing more than just simple digging and planting in the garden you’ll probably want more than just the basic protection from dirt and scratches. 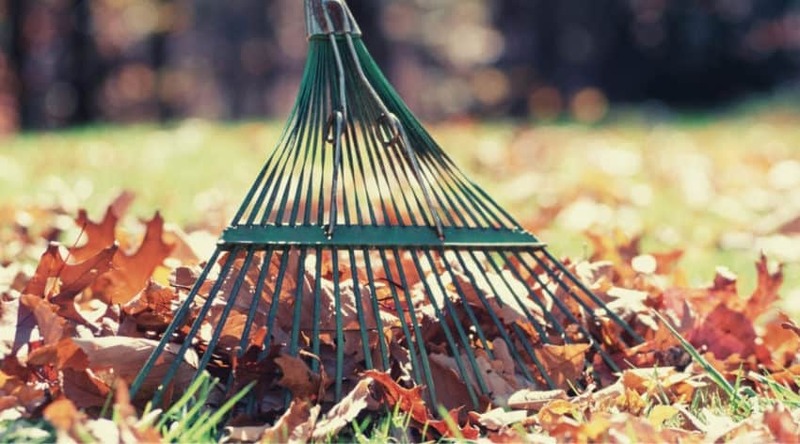 Pruning, cutting, and working with tools such as rakes and lawnmowers can result in branch punctures, thorns cuts, and blisters. And depending on the amount of time you spend in the yard and garden doing some heavier work, you’ll want to protect yourself accordingly. Fingertips on gloves tend to wear out the quickest with any sort of constant friction. Because of this many gloves are reinforced in some manner with a more durable material, especially if the glove has a lightweight base made of cotton or a similar material. If you use your gloves regularly, this is an added protection you will want to consider in order to get more life out of your purchase. The seams of well used gloves can easily fail in time, especially when heavier material is used if it is not double stitched. Check the quality of our gloves for double stitching along seams and areas of reinforcement to prevent future ‘peeling’ or pulling up of the material. So even with heavy use- if one set of seams fail, the other is there to help keep it all together. You’ll of course want to purchase a glove that will be useful for more than one task. If you mix your heavy garden rden work with light garden work, a glove that is equally up to both tasks would be the more frugal buy. What sort of tools will you be using? Gripping larger handled tools, such as shovels and rakes is pretty easy with any sort of glove, but if you need to use pruning shears or loppers and need a firm grip on a smaller shaft, then you will want to take into account the flexibility of the glove. How often do you use your gloves? 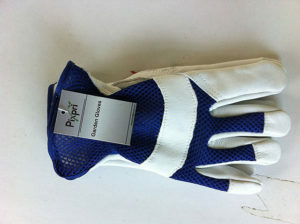 If using your gloves is a daily occurrence, purchase something with good reinforcement and durability for lasting wear. If your gloves are only for specific jobs, and aren’t used too often, then a less expensive quality might be a better consideration. What sort of vegetation are you coming into contact with? Plants come in all shapes and sizes, and so do weeds. That includes things with itchy fuzzy stems and leaves, prickly hairs, sharp thorns, sticky substances, and sharp ends. 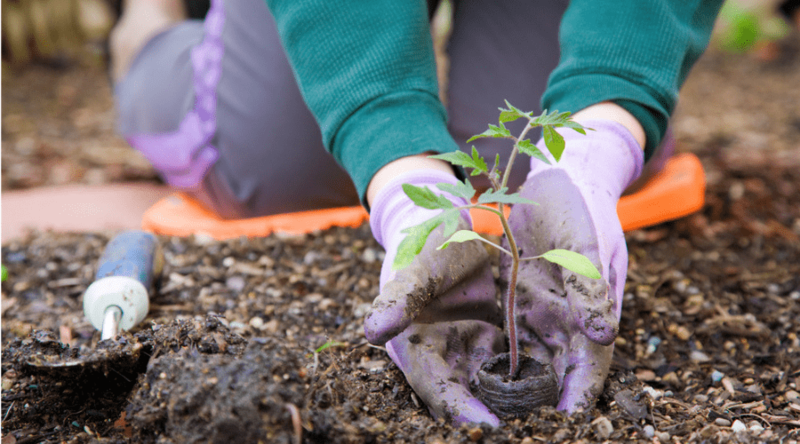 Buy a gardening glove that can withstand what you know you will be in contact with, or that is even washable if the need arises. And most of all, will keep you protected. This is a glove made with thorns and other ‘biting’ plants in mind while working in your garden. The latex coating also staves off the bite and sting of insects commonly found in and around vegetation for an extra peace of mind. 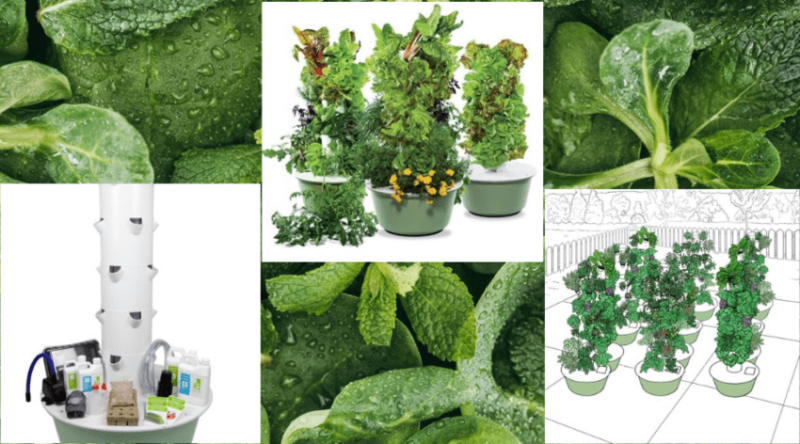 The coating covers a knitted base that has an extended fitted cuff for added protection, and also keeps moisture from both plants and soil from soaking into the material. 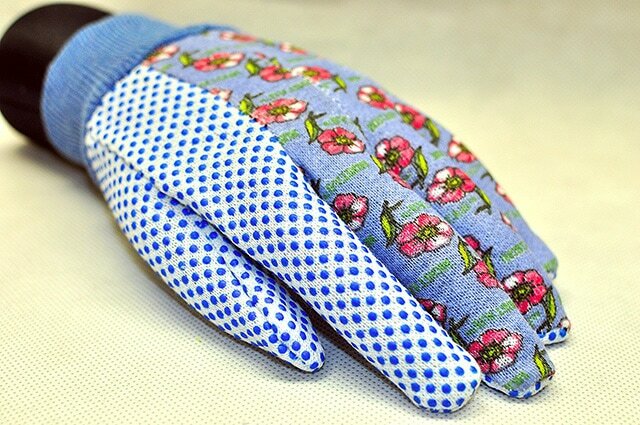 The knitted shell also helps keep your hands cool while you work and wicks away any moisture created by your hands. 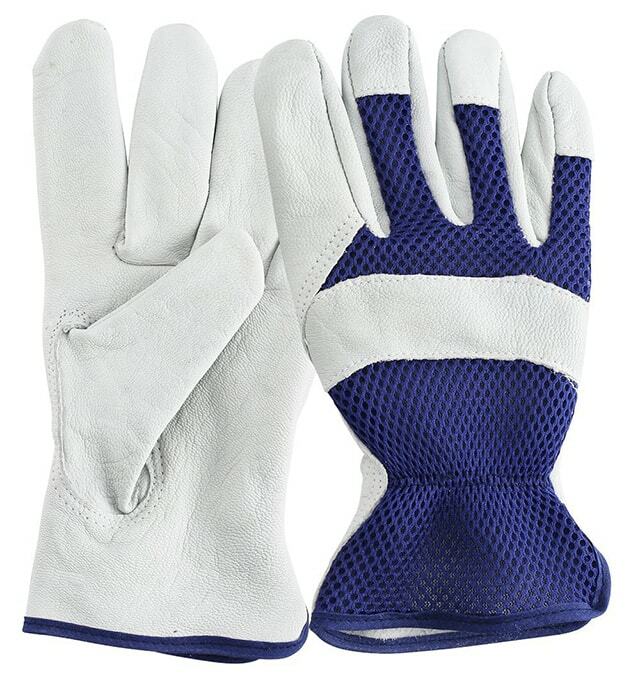 Since it comes in both men’s and women’s sizes, this a more fitted glove for a comfortable job well done. Soft and flexible goatskin leather is double-stitched and reinforced at joints to keep from tearing and wear at areas of high friction. The leather is also puncture resistant to provide you with added protection when grasping and pulling thorny vegetation. 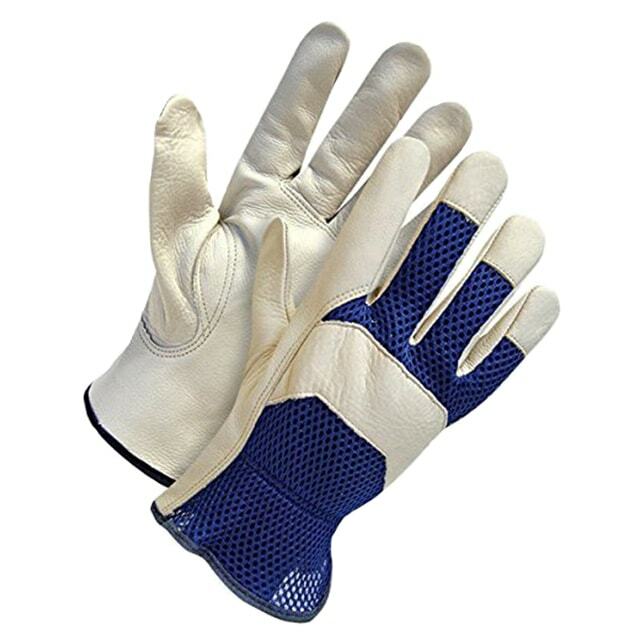 A thicker mesh backing helps keep hands cool and allows moisture in hands to dissipate and dry easily. Because of the goatskin suppleness, you can also get a good grip and have added flex through the finger joints, a plus for gardeners who want to use their pruning shears or other small tools with their gloves. 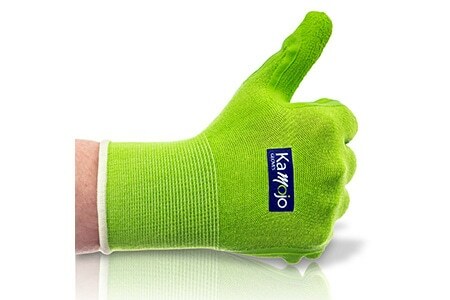 This is definitely a step up from cotton or cotton combination gloves for lighter yard and gardening work. As a unisex gloves, it may not fit all hand sizes, so be sure to take into consideration your hand size before purchase if you are looking for a snug fit. Average hand sizes in both sexes should find this a comfortable and versatile light duty glove. 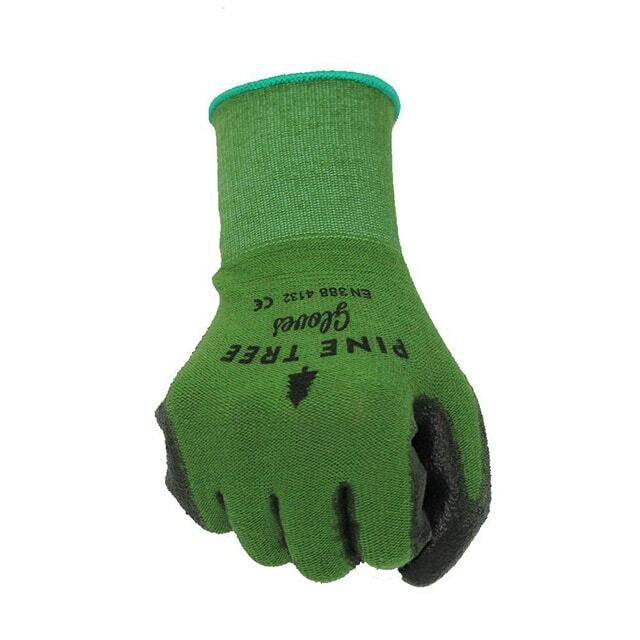 Made for strength, durability, and comfort, these protective gloves are built for a long day in the garden getting after the toughest of vegetation. Available in both a men and women’s version, you can pick your size for the best fit possible. Made of a puncture resistant synthetic leather and spandex, fingers, palms and knuckles are reinforced to withstand extra wear and tear. An extra bit of elastic in the wrist helps keep them from slipping as well, and the long gauntlet provides protection to your elbows without causing the undo stress of extra heat like gardening sleeves can do. Not all the seams are double-stitched however, so chores that include a lot of pulling at that glove, such as shoveling, might be best left to a sturdier glove. The flexible knuckles with the added layer of protection is definitely a perk for those who work in the roses or around cactus as well. 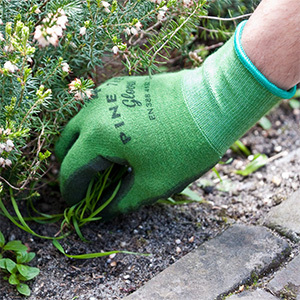 This four pack of breathable, yet water-resistant Nitrile gardening gloves are exactly what is needed for an added barrier for light weight work in the yard and garden. Fitting like a second skin, they are great for keeping hands clean, but are durable enough for basic digging, pulling, and planting as well as additional protection for elements and insects. Because of their snug, flexible grip, they also are perfect for use when you need to have your hands available for zippers, tying, or other small tasks where finger dexterity is a must. In fact, reviews even state you can use your smartphone! These are not a popular pick for heavier duty tasks however, and they are not puncture proof and will not wear well with constant heavy use. They are not marketed for this though, and fun colors for women, and a larger version for men, round out the affordability and draw of these gloves when you are looking for a simple, yet dependable solution to your hand protection needs. 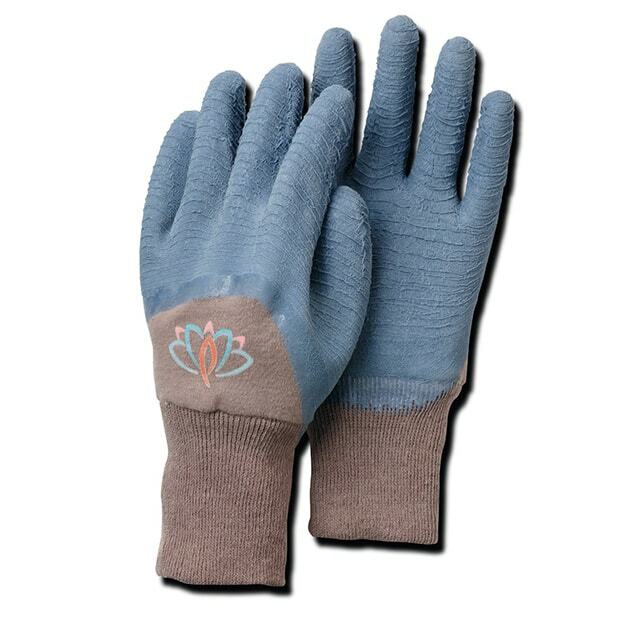 Natural, breathable bamboo threads with a reinforced nitrile lining make these garden gloves a good choice for light work in the yard and garden. Toted as a soft and durable alternative to other materials, these gloves are flexible and fit close to the skin. They also are washable (although do not dry in dryer) in case you get them covered in garden dirt and prefer to keep your gloves malleable and clean between jobs. Bamboo threads are naturally hypoallergenic and antibacterial as well for an added barrier of protection for sensitive skins. Although they can handle simple brambles and thistle like vegetations, they are not puncture proof and do not hold up well to thorny plants over time, nor provide complete protection. 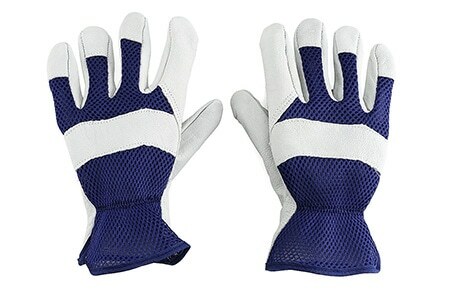 Although they are a unisex glove, you can purchase different sizes for different fits and sized hands. They are supposed to be a close, snug fit for extra finger sensitivity and use with small tools. Even if you aren’t a big fan of covering your hands while working in the garden, at many times it’s a necessity for added protection. There are a variety of different gloves made of many materials, of varying thicknesses, and durability to fit your needs. Despite not being a fan of gardening gloves, my pick is the Atril Nitrile Garden Gloves due to the fact that they are supposed to fit like a second skin, and not having hand mobility is EXACTLY why I am not a big fan of gloves. I need to be able to access tools, amongst other things, and these gloves seem up to the task. 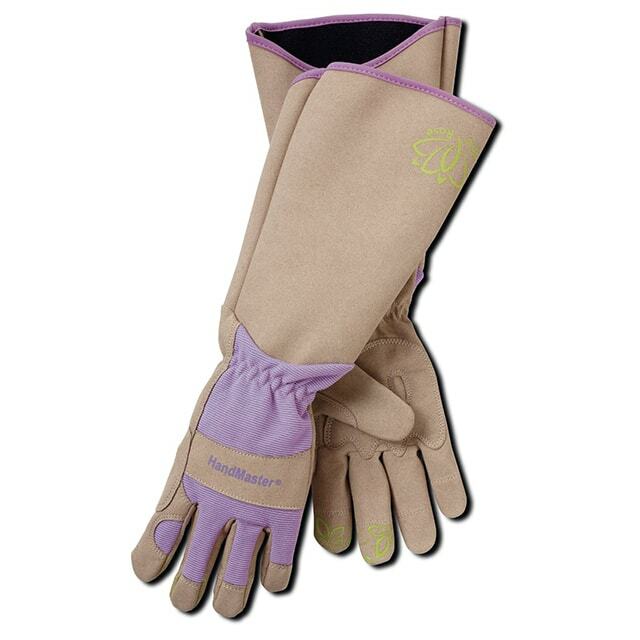 Protection from dirt and insects, a well as the ability to grip and pull weeds is exactly what I like in a glove when I can multi-task – and the fact they come as a multi-package is another perk. 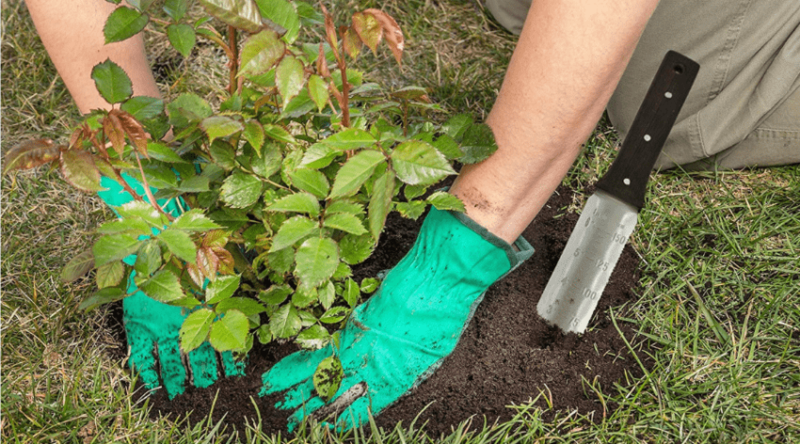 Whether you need simple hand coverage for digging and planting, or a more durable thickness for pruning and work in thorns, the above choices should give you a good idea of what is available on the market for your specific gardening glove needs. What’s your favorite? We would love to hear your opinions, or comments on what brands have worked best for you. Please share below, and of course if you’ve enjoyed this article, please like and share it with your friends!